Many people do not understand why their flowers seem to be disappearing daily and that the cause is the lowly slug. Slugs love dampness and under the cover of night, when the dew is present, they are dining on your plants. Read on to learn how to rid a yard of slugs. Understand that slugs are notorious for eating seedlings, flowers and vegetables while you sleep, and they can do a lot of damage in short order if they go unchecked. Their favorite foods include rotting vegetation, fungus and carrion (even other dead slugs). If you suspect slugs are responsible for damaging your gardens, go outside early in the morning while the dew is still on the grass you should should spot them as they glide slowly over the grass, hide under damp leaves or curl up in damp shadows. Know that there are several alternatives for getting rid of slugs, some easier than others, and a couple solutions are very inexpensive. You probably already have the ingredients in your kitchen. Just give the slugs a liberal pinch of salt and they turn to gel. Ammonia and water, mixed (5 to 10 percent ammonia) kills them with a few drops. Don't use too much or it may damage the grass. Or mix 1 tsp. sugar with water enough to almost fill the plant pot saucer and put this out where you seem to have the most damage. Slugs climb in and drown. You can keep the container in place for several days before "re-setting" the trap. You can also use beer. Keep in mind that there are also repellents that you can buy at the garden center or hardware store. These substances are painful to slugs when they come in contact so they stay away from that particular spot. 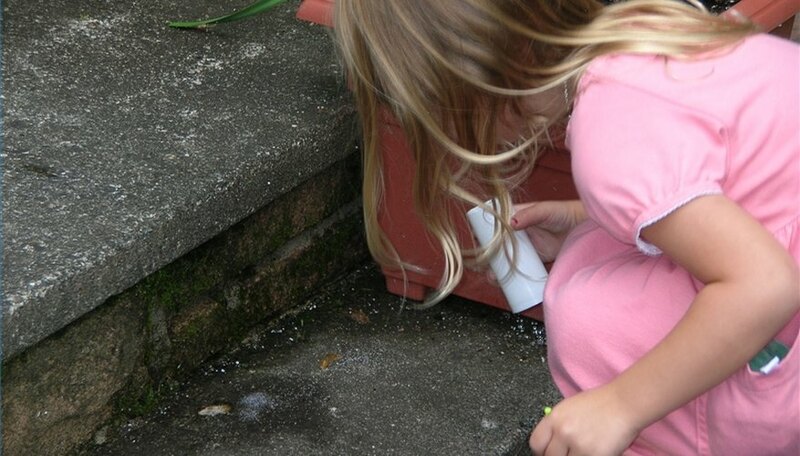 There are also slug barriers that are in granular, gel or paste that you can spread around gardens. Wood ashes or diatomaceous earth is an irritant to slugs if they try and cross it as well. Repellents and barriers work well in fairly dry weather; extended rain or watering washes them away. Natural predators to slugs are frogs, toads, snakes and some birds. Apparently slugs have an unpleasant taste to other creatures. Keeping vegetable and flower beds free of slugs is not an easy process; they seem to multiply as fast as you can kill them, but losing precious seedlings is not an option. Taking a walk with a salt shaker morning and night seems to keep them at bay. Remember what works for you may take some experimentation, but don't give up. How Can I Stop Bugs From Eating My Tomato Plants?